This ‘what if’ thinking pattern is most powerful when we have to encounter the unknown or unexpected, says Dr. A. Geethan, a reputed psychotherapist and founder of Nibbana. This type of thinking creates its own whirlpool of disturbance that saps our energy. In such a situation he suggests that we should relax, take a few deep breaths and calm ourselves with a firm conviction that this too shall pass or that we are capable of handling this situation. But all this is easier said than done. My thoughts were running wild. I was also reminded of a child who succumbed to dengue. Though we may be doing our best to get rid of mosquitoes from our vicinity by taking measures such as planting Tulsi plants in the garden, not allowing the water to stagnate and keeping the surroundings clean, some situations are simply beyond our control. Prevention is always better than cure but then we should also strive to have a better immune system that is resistant to diseases and this can happen only if we adopt a health lifestyle and a sensible diet. But in spite of everything, if you do contract dengue or malaria, there is no need to panic as they are curable albeit it takes several months to recuperate from a bout of dengue / chickungunya. My chain of thoughts was broken when the train stormed into the station. Gingerly, I boarded it and settled down in my seat. I then tried this stress-busting, easy-peasy breathing exercise; it calmed me to a great extent and very soon I regained my composure. Now some info about this deadly Dengue. The Aedes genre of mosquito led by Aedes Aegypti is the carrier of the dangerous dengue virus. It’s a beautiful looking mosquito dainty and black with streaks of flashy white and breeds only in clean water. It bites only in the daytime or in the early hours in the evening. Dengue is one of the most important and emerging diseases in our country, says a reputed doctor from Manipal Hospital. Called the ‘break-bone’ fever, physicians diagnose dengue when the patient complains of fever accompanied by heavy pain in the bones, headache and pain around the eyes and perhaps a touch of muscle pain. When the individual has been infected by more than one type of Dengue virus, the disease gets more severe and becomes haemorrhagic. Internally, the count of platelets, a kind of blood cell that aids clotting and seals off lesions comes down. Externally, the affected person notices rashes and perhaps senses internal lesions. The fever generally begins to fall on the fifth day. This is when the real danger begins. In some, the fever comes down rapidly. While we imagine that the patient is recovering unusually fast, in reality, the patient is actually at great risk as the body is put in a state of acute shock. The pulse rate slows down and blood volume rapidly comes down. Emergency measures such as intravenous monitoring of blood volume and content has to be taken to save the patient. The trouble with dengue fever is that its prognosis is unpredictable, so you are left unprepared and without a strategy to counter the fever it initiates. Worse, even physicians fail to recognize the fever and many a case of dengue gets treated as just another viral infection. 99% of physicians fail to recognize the Dengue Fever, says a reputed Medical Professor at KIMS. While in some, the defense mechanism of the body takes care of the recovery, tragedy strikes when patient’s condition deteriorates internally. 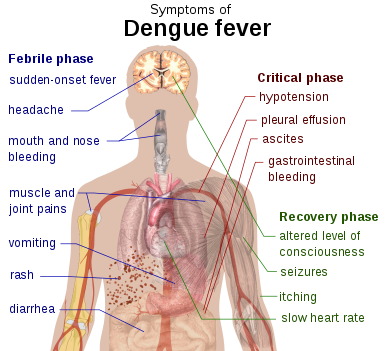 However, the patient does not get the emergency treatment because externally the patient shows signs of recovery, with a significant drop in temperature. Being viral, Dengue has no antibiotic to fight it. So, the only course of action is blocking another link in its chain of transmission – preventing it from being in circulation at all. This means not allowing the Aedes mosquito to breed or exist. It actually is not such a tall order, because the mosquito breeds only in clean water, the accumulation of which is largely under our control. Also go read through these materials for still more info about dengue. As for prevention methods, don’t allow water to accumulate unchanged in flower pots, air coolers, etc. Clear off all discarded rubber tires, coconut shells and beer bottles and other potential water accumulation centres in your area and don’t fail to ensure that your water tanks are closed and cleaned periodically. If you do get any kind of fever especially in the rainy season accompanied by aches and pains you should immediately rush to a doctor and ascertain whether it is dengue, chickungunya or any other viral fever. Your delay or indifference could complicate matters and the consequences would be fatal. When you are recovering from dengue, you should adopt these measures for a speedy recovery. * Keep yourself hydrated. Drink lots of water – water that is sufficiently boiled and cooled. * Sleep in a clean, comfortable room. * Keep away from salty food stuffs or use very less salt in your meals. * Rice gruel (Kanji) is an excellent food when you are recovering from any sort of fever. * Avoid spicy and fried foods. * In the morning, before your breakfast take 4-5 Tulsi leaves – bite and chew them well before swallowing. * Eat green leafy vegetables that is steamed or boiled. Better to stay away from raw vegetables during this period. * You can regularly take Chyavanprash (Buy Dabur Chyawanprash from Amazon) to boost your immunity. * Instead of caffeinated drinks, try drinking ginger, basil, fenugreek and green teas. * Take adequate rest till you have the strength to stand on your feet. After a month or so, if you are feeling better go for a short walk and then as you feel better and better you can slowly increase the distance. Crush 2 cardamoms (with their shells intact), lemon sized coriander leaves and 4-5 Tulsi leaves in a mortar and pestle. In a pan add a glass of water, mix the powdered ingredients and let it come to a boil;. Then lower the flame and let it simmer for a while. Then strain the resultant liquid in a glass and squeeze the juice of half a lemon in it. You may add black salt (optional) also. The recommended intake for adults is one glass and for children it’s half a glass each time. Have this 3 times in a day. It brings down the temperature and this same recipe can be used in treating an ordinary fever / flu as well. Vaividang / Vidanga (Embelia ribes), Papaya paste (Cut a papaya, discard the seeds, remove the peel and blend a few pieces in a blender to get a smooth paste), Honey (Shahad), Jaggery (Gud), Tulsi (Holy Basil) leaves. Add a glass of water to a pan and heat it. Add 1 tsp of Vaividang seeds (It’s very good for fighting flatulence and you can get it from any Ayurvedic Pharmacy), 1/2 – 1 tsp of Jaggery & 5-6 Tulsi Leaves. Stir well and let the jaggery melt. When it comes to a boil, add 2 tsp of papaya paste. Bring it to another boil. Then turn off the gas immediately; too much of boiling can reduce its efficacy. Strain it in a glass and add 1 tsp of honey and mix well. Have it twice a day, once in the morning after breakfast and once before you retire to bed. Dosage for adults and children as mentioned in the recipe #1. Time is the best healer! Rest, sleep, medication and a positive frame of mind will help you to be up on your feet quickly. The best way to prevent dengue fever is to take special precautions to avoid contact with mosquitoes. don't stay near stagnant water! I am distressed alongside the circumstances in Syria! many deaths this dengue season.